Gold for June delivery declined $3.90, or 0.3%, to close at $1,291.30 an ounce on the Comex division of the New York Mercantile Exchange. The settlement was the lowest for the most active contract since March 11. "Gold is coming towards the support level of $1,280. People are anticipating that if gold dips in this level and the buyers step back in, it might create a short-term bottom, making it an opportunistic time to start pursuing gold," Reuters quoted Michael Matousek, head trader at U.S. Global Investors. 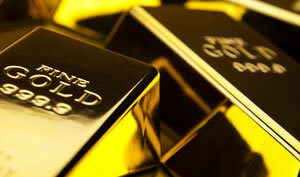 Gold futures ranged from a low of $1,286.30 to a high of $1,295.20. They dipped 40 cents last week, for their third straight weekly loss. Silver for May delivery inched up 1.2 cents, or less than 0.1%, to settle at $14.975 an ounce. Silver futures traded between $14.79 and $14.99. They fell last week by 0.8%. July platinum fell $4, or 0.5%, to $894.50 an ounce, ranging from $882.50 to $898.30. Palladium for June delivery dropped $15.50, or 1.2%, to $1,334.70 an ounce, trading between $1,332.80 and $1,349.60. They moved opposite of each other last week with platinum falling 0.8% and palladium rising 0.3%. Gold lost $8.65, or 0.7%, to $1,285.65 an ounce. Silver declined 13 cents, or 0.9%, to $14.935 an ounce. In LBMA results last week, gold added 0.5% and palladium gained 1% while silver shed 0.9% and platinum lost 0.4%.